The theme of finding balance in one’s life continues in Key 4, The Emperor. 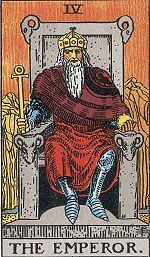 He sits on a throne flanked by rams’ heads, symbolizing Mars energy. In his right hand (the active, male side of the body) is the Egyptian ankh, also called the Cross of Life. The ankh also is a symbol of Venus, here representing the need for balance with love and power. In his left hand (the passive, feminine side of the body) he holds the same globe found in The Empress’ right hand. Again, this denotes the need for balance between love and power and between Spirit and matter. The red of his cloak symbolizes action and determination, as we have seen in The Fool, The Magician and The Empress. The Emperor, as Key 4, numerologically represents all that is secure, with a four-square base of stability. Four is one of the building blocks of divine thought: the four elements (fire, air, earth, water), the four seasons, four points of the compass, the four rivers in the Garden of Eden, and the four letters of the sacred name of Jehovah: IHVH. The mountains in the background are the same mountains we saw in Key 0, The Fool. Just as they represented cold intellect in that Key, they represent mental activity and authority in this Key. To review, The Magician is the active principle of life connecting with Spirit and The High Priestess is the passive principle of life connecting with Spirit. As The High Priestess becomes The Empress after initiation, so the Magician becomes The Emperor. The Emperor reminds us that the Spiritual world and the Material world must come together in balance and harmony if we are to move forward on our life path. We are spiritual beings having a human experience. Thank you so much for taking the time to put this blog together. Such a wealth of information! Much appreciated.